Hitchens points out that other pieces of the Parthenon have been returned by the Vatican Museum, the Italian government and the University of Heidelberg in Germany. So far, officials at the British Museum have refused. The above-statement from the British Museum is like many others that have been offered in defence of illegal or illegitimate detention of the cultural objects of others. When you analyse the words carefully they do not make sense or lead to absurd conclusions. “Current division” sounds as if there had been a deliberate decision to decide the Parthenon Marbles whereas we all know there was no such decision and that the original perpetrator had no such ideas in mind. The post-facto rescue operation by the British Museum has been a fiasco all along. If we took seriously the logic underlying the citation above we would have to proceed dividing the world’s famous cultural objects into two or several parts: The Bust of Nefertiti divided into two parts, one half in Berlin and the other half in Cairo, the portrait of Mona Lisa divided into two parts, one in Italy and the other half in France, the bust of Queen Mother Idia divided into two parts, one part in London and the other part in Benin. The mere listing of such divisions shows that this is an absolutely absurd idea. The British Museum has arrogated to itself the right and duty to tell the story of others. It has been most of the time doing just that: telling stories. Others may prefer to write their own histories. Those holding on to the cultural artefacts of others may decide in accordance with their own moral standards whether to return them or not. But for the sake of sanity, they should spare us such baseless explanations or arguments. We still have other things to do in life besides worrying about cultural objects. 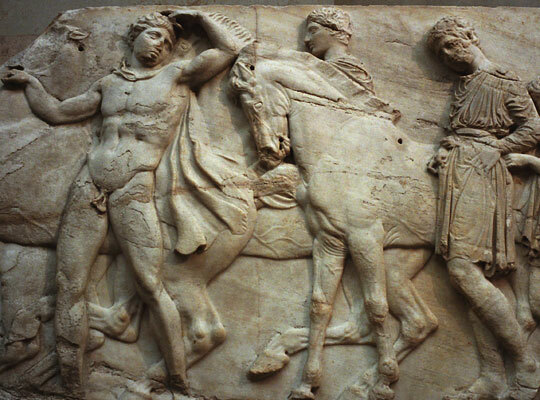 The Trustees of the British Museum also assert that the marbles were acquired from the legal owners at the time, and are thus the legal property of the British Museum (with ownership being transferred from Elgin to Parliament to the Museum). Of course, those ‘legal owners at the time’ were the Ottaman Empire which had invaded Greece and subjugated the Greek people. Therefore, the Trustees’ position appears to be that when one sovereign state invades another, the cultural heritage of the invaded state becomes the legal property of the aggressors in perpetuity. In other words, anything stolen from Jews by the Nazis during WWII remains the property of the German people. As a British Citizen I am disgusted that our government shifts responsibility to the Trustees on this issue, and then fails to abrogate them for their imperialistic and arrogant stance.